The Victoria Memorial in Kolkata is one of the major landmarks of the city. This beautiful structure that was built in the memory of Queen Victoria, is a museum and a tourist attraction. There are many interesting facts about this must visit travel attraction of India. Let's have a look at some of the interesting facts of Victoria Memorial in Kolkata. The structure is built using a blend of both British and Mughal architecture which is known as Indo-Saracenic Revival architecture, which is an architectural style which was followed in British India during the late 19th century. The foundation stone of Victoria Memorial was laid by Prince of Wales in 1906. 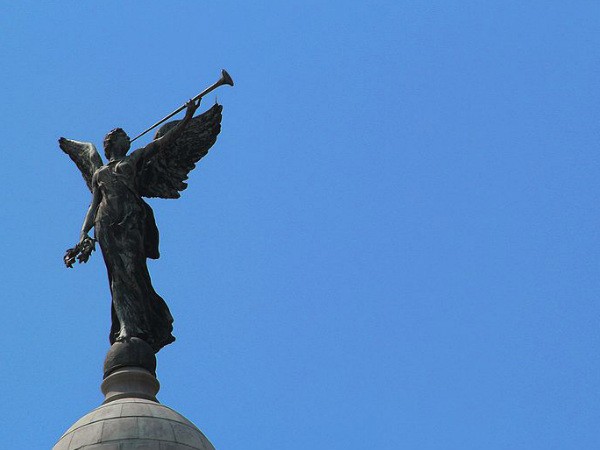 The figure of 'Angel of Victory' is erected on the central dome of Victoria Memorial. Mounted on large ball bearings, the figure rotates with the wind. Surrounding the central dome, there are several allegorical sculptures that include that of art, architecture, charity, justice, motherhood, learning and prudence. Like Taj Mahal, Victoria Memorial is also built using Makrana marble. The dome and other structural elements of the structure also echo the design of Taj Mahal. There are 25 galleries in Victoria Memorial. The galleries include the sculpture gallery, the royal gallery, the central hall, the portrait gallery, the arms and armoury gallery and the Calcutta gallery. The other exhibits of the museum include coins, stamps and maps of those times. Before the Victoria Memorial was erected, the location housed Presidency Jail, which was later demolished from there and relocated to Alipore, to construct the memorial. This massive structure was funded by Indians. Donations were called from all over the country, and the amount collected was used for the construction of this spectacular memorial. The British government also partly funded the structure. As a part of decolonisation after 1947, many of the statues erected by the British all over India were either removed, replaced by Indian ones or moved to the garden of Victoria Memorial. Near the gate, you can see "VRI" written which probably stands for Victoria Regina Imperatrix, translating to 'Victoria Queen and Empress'. This might have meant that Victoria who is a Queen of England, is an Empress of India. Another intriguing writing is 'Dieu Et Mon Droit' written above the entrance of the memorial. This translates to 'God and my right'. This could be a reference to the monarch's right to rule.